1 comments | First published March 15, 2017 , last updated April 8, 2019 . Reading time: 5 minutes. This group of haircuts consists of 3 different cuts: burr cut, induction cut, and butch cut. The main differentiator between them is the length. That’s it. Induction cut is in this case the shortest while butch cut being the longest. 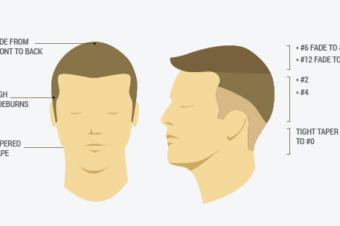 Burr, induction, and butch haircuts are commonly associated with military (just like high’n’tight), as they are commonly given to new soldiers. Because it’s very practical (low-maintenance, easy to do yourself), it sticks with privates through their entire military service and oftentimes even longer. 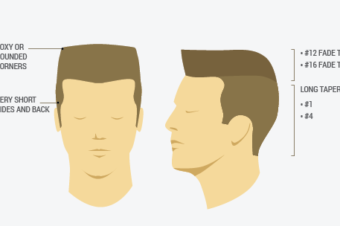 These three haircuts (sometimes called ‘wiffle haircuts’) are normally categorized as military haircuts along with high and tight, flat top, and crew cut. The reason these super-short haircuts are exercised in the army is mainly because of their convenience. 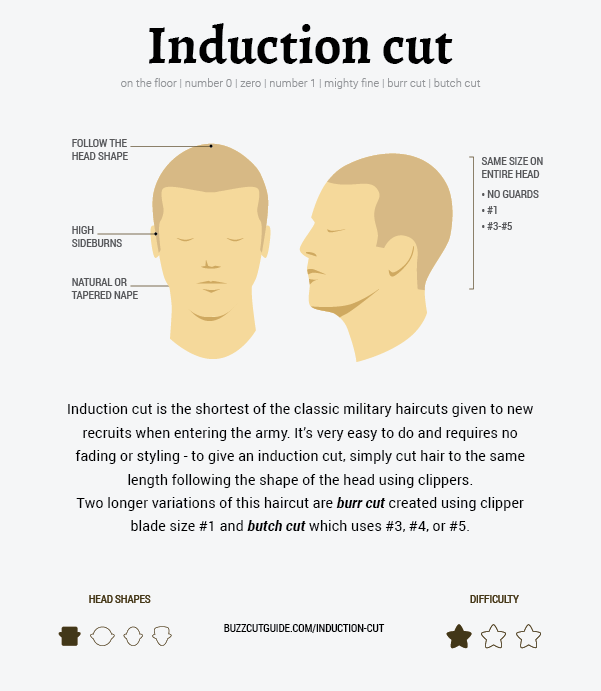 As mentioned earlier, they are easy to do – either by yourself or someone else – but that’s not the only reason burr cut, induction cut, and butch cut are so commonly given in the military. Another reason is that they have a psychological purpose when entering the army, figuratively stripping the candidates of their individualities and this way promoting the ‘team spirit’. By traditionally giving new recruits in the US army the induction cut (the shortest of all three) shortly after entering the boot camp, they give them the ‘rite of passage’ (hence the name induction cut). 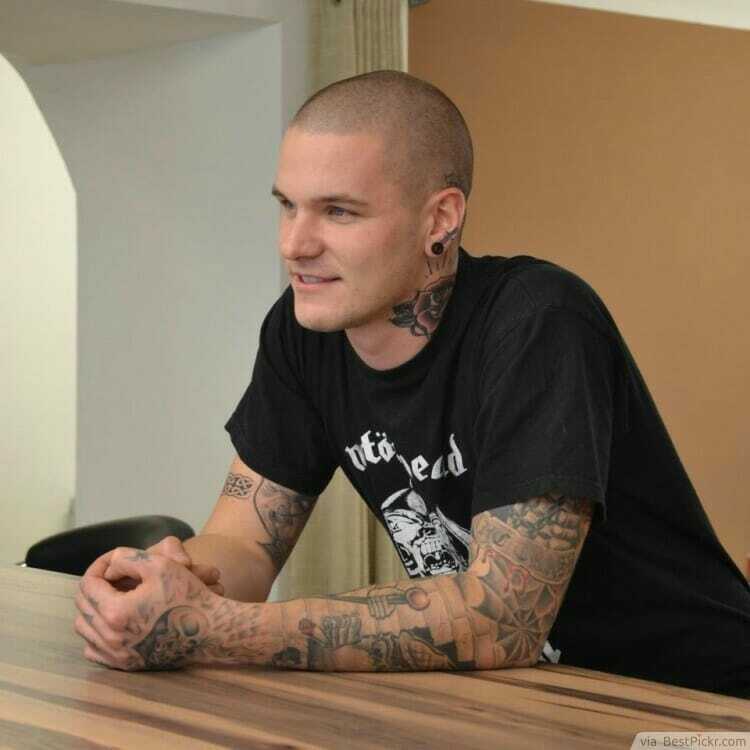 Who is this buzz cut for? These once regarded just military haircuts are now worn casually by people of all ages. There is truly no specific demographic patterns of people who wear burr, butch, and induction haircuts. It’s suitable for everyone, regardless of gender, and appropriate for almost any job. Kids get these simple buzz cuts either because their parents are too lazy to take them to the hairdresser’s or because the child got lice at school, and getting a very short haircut is the perfect remedy to get rid of lice. It’s worn by adult males who are starting to lose their hair and cutting their hair short oftentimes conceals this process. It’s also pretty popular with young hip women who like to stand out and, ironically, show off their personality. 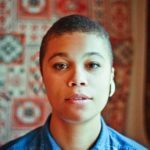 If you’re looking for a DIY buzz cut that is super-easy to do, or if you’re a beginner in at-home buzz cutting, definitely try out one of these three. What burr, induction, and butch haircuts have in common is using the same length of guards all over the head. 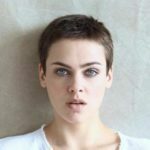 The haircuts are very adaptable, so you could have virtually any haircut, following the tutorial you will end up with one of these buzz cuts. This is the shortest of the three and the shortest haircut possible without using a razor blade. To give this cut, you would not use any guards on your hair clippers (just the blade). That’s why it is sometimes referred to as ‘number 0’ or ‘zero cut’ or simply ‘zero’. Other known names are ‘on the floor’, ‘mighty fine’, and ‘the Army’s #1 haircut’. Burr cut is exactly the same as the one described above, also sometimes given in the army, but slightly longer. It uses a guard number 1 (sometimes, 2). People also call it ‘number one’. 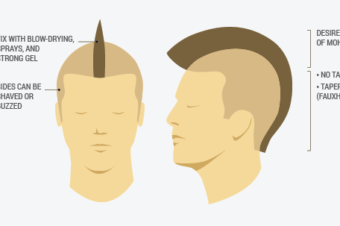 If you’re new to DIY haircuts, a burr cut is easier to do because of the guards. Butch cut is the longest of these three. It gives a bit more ‘fuzzy’ look and uses guards from 3-5. This leaves longer hair on the head. The look can be dramatically improved by fading the sides with slightly shorter hair clippers settings. Butch cuts are oftentimes groomed with hair wax. Set yourself or your ‘victim’ up as described in our tutorials and get the tools ready at hand: a comb to disentangle the hair before you start, and clippers. Start on the top, going with the clippers from front to back. Pay particular attention to the sides. To cut the back, start at the nape and go from the bottom to the top until you match the work you did on the top when you started. Make sure to hit all parts of your head, and try cutting in multiple directions on the same spot to get all the hair. For this haircut, you don’t necessary need a secondary mirror as we normally recommend — simply stop cutting when you don’t hear the buzzing sound anymore. Pass your hand through the hair to make sure it is uniform and you’re ready to go!